Rachel Dolezal, the former president of the NAACP chapter in Spokane, Washington, who was "outed as white" last week after allegedly pretending to be black for nearly a decade, is also an "an award-winning Mixed Media Artist," according to her art blog. Dolezal received a scholarship to the university and, although there was no option on the application to identify herself as black, her mother has claimed that she may have insinuated that identity "because her portfolio of art was all African-American portraiture." Judging from her art blog, Dolezal appears to work primarily with acrylic paint, charcoal and collage. Her paintings, frequently depicting black subjects, feature titles including "Afrika," "Reconstruction," and "The Great Escape," which a family member of hers dubbed "The KKK Stuck in the Brown Space." In the credit information for "Afrika," Dolezal writes: "I used pieces from clothing, sports, national geo, & other magazines to bring together different 'pieces' of the earth & the human experience, in this face of our mother as a tribute to the Motherland." Needless to say, the images are problematic considering Dolezal's recently revealed circumstances. Aside from the glaring issues of cultural appropriation and deceit rooted in the images, there also appears to be some plagiarism involved. Twitter user Jolie Adams recently juxtaposed one of Dolezal's acrylic paintings titled "The Shape of Our Kind" with J.M.W. Turner's 1840 work "The Slave Ship." As you can see, the works are nearly identical. Dolezal's version of the image constitutes the middle panel of a triptych, accompanied by the poetry of her biological brother and published writer Josh Dolezal. She makes no mention of Turner's work, although commenters on her blog certainly do. The first comment, posted by user isabelleduvall, reads: "No shoutouts to JMW Turner?" and others quickly follow suit. As of publication of this post, over 2,000 Twitter users have accused Dolezal of plagiarism. If Dolezal's cocktail of vigorous artistic appropriation and artistic "blackface" appeals to your aesthetic tastes, lucky for you: Two of her works are available for purchase on eBay. 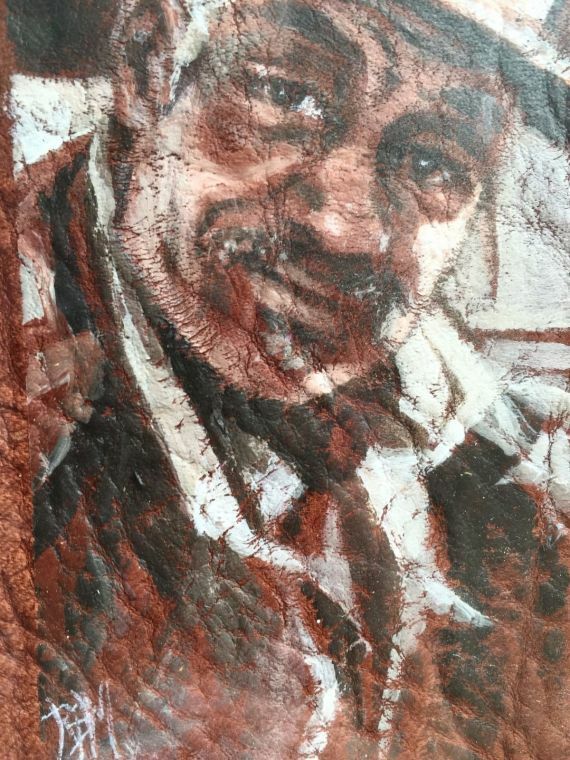 The two charcoal on elk hide portraits depict an older black man and a young black child. The caption for the drawing above reads: "A hand-drawn charcoal depiction of a black man adorns elk-hide leather -- bridging Rachel's youth spent hunting elk in Montana with her deep involvement in the black civil rights movement." If you're interested, bidding starts at $5,000, and for just $50,000, you can own the charcoal immediately.